On December 8th, 2011 DIRECTV announced the availability of 2 of the most exciting digital video recorders in years – The DIRECTV TIVO DVR and the 5-tuner, RVU enabled DIRECTV Home Media Center DVR. The long anticipated DIRECTV TIVO DVR utilizes all the TIVO features you have come to love in a Blu-Ray quality (1080P) High Definition format. Wish List, Swivel Search, Season Pass, Thumbs Up/Thumbs Down and all the other features that have become indispensable to TIVO users. Because it’s from DIRECTV you can set your TIVO DVR from any smartphone, iPad or computer and have access to thousands of movies and shows on-demand. Record up to 400 hours of programming in HD! The DIRECTV Home Media center is a revolutionary RVU enabled device that puts an end to recording conflicts and deleting your favorite shows to make room for new ones. It features 5 tuners so you can record up to 5 shows at one time and its 1 TB hard drive gives you the capability of recording up to 800 hours of your favorite programming in crystal clear 1080p high definition. Store up to 1600 shows in standard definition! 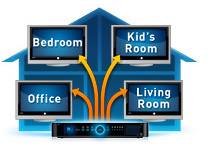 The HMC also has the ability to utilize DIRECTV’s ground breaking Whole Home DVR service. Record in one room and watch, pause and rewind in any room in the house. Access any of over 7000 movies and shows on DIRECTV Cinema as well as get access to hundreds of movies a month before they are out on Netflix, Red Box or Blockbuster via streaming satellite video. The HMC also has an industry first – RVU capability. This means that if you have an RVU enabled TV (currently only the Samsung D6000 series LED TV has the technology embedded), you will not be required to use a set top box with each TV. It’s All About Satellites is New Mexico’s Oldest and Largest DIRECTV dealer. DIRECTV service for your home starts at just $29.99 for over 150 channels with 3 FREE months of HBO, STARZ, Showtime and Cinemax for a limited time. DIRECTV service for your business will give you the best return on investment you can make. to order DIRECTV for your home or business. Find out more about the new DIRECTV TIVO and Home Media Center DVRs.